Remove butter from fridge 20 mins before you start mixing, the butter should be just soft but still very cold so it doesn’t melt through the pastry while still mixing. Add flour and salt to bowl of processor, add butter, pulsing in 1 sec bursts about 3-4 times to partly combine. You should have a floury mix through which you can see squashed pieces of butter. Turn out onto a clean surface and gather together with your hands. Sprinkle the combined water and vinegar over the flour. Using the palm of your hand, smear this mixture away from you across the bench. Gather together again and repeat smearing process twice more before gathering dough again. You may need to smear once or twice more to bring it together, you should still be able to see streaks of butter marbled through the pastry, this gives a slightly flaky texture to the pasty. Shape into a round flat disc about 2cm thick. Enclose in plastic wrap and refrigerate for at least 2 hours or overnight. Remove pastry from fridge 20 mins before you wish to roll it. Sprinkle a little flour on work surface and rub a little flour over your rolling pin. Working from the centre of the pastry, gently roll pastry away from you, then turn pastry about 30 degrees and roll out again. Repeat process until you have a flat round disc, about 3mm thick. Sprinkle extra flour over the bench and rolling pin as needed, but try to use it as sparingly as possible. As you are rolling the pastry, bear in mind that you are trying to flatten it into a disc, not ferociously stretch it in all directions. Stretching will cause it to shrink excessively when baking. Return the pastry to the fridge, covered in plastic wrap, for at least 2 hours to allow the gluten to relax, then use to line tart pans. Roll out pastry following instructions and use it to line base and sides of 4x 10cm fluted, loose bottomed tart pans. Place in the fridge while preparing the filling. Preheat oven 220 C.
Blanch asparagus in boiling water for 1 min, then immediately plunge into a bowl of cold water. Drain and set aside. Put eggs, cream and salt in a bowl and whisk together using a fork. 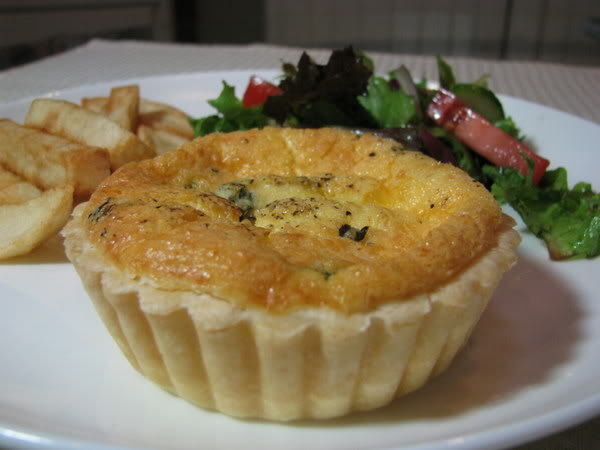 Place the pastry shells on a baking tray. Scatter asparagus and cheese evenly among cases, then sprinkle over tarragon. 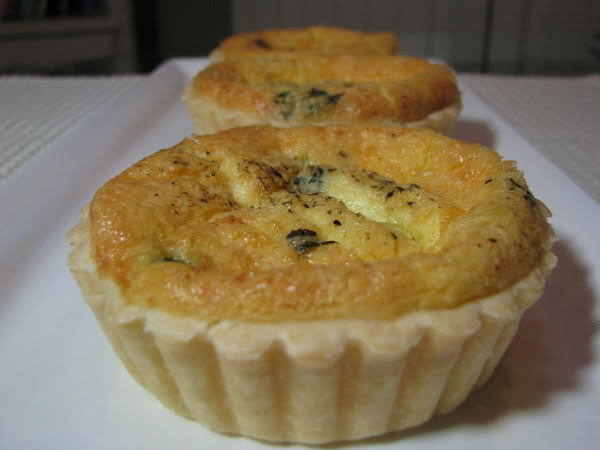 Pour over the egg custard to fill each tart as much as possible without overflowing. Season with pepper, to taste. Slide the tray onto the middle shelf of the oven, reduce oven to 170 C and bake for about 30-40 mins until the custard is just set and starting to colour on top. Allow to cool a little before serving.